One thing that I always encourage my students to do is to register in competitions and contests about architectural visualization. Be a part of a competition is a great way to put your skills to the test, and compare your work with the productions of other artists. In architectural projects, we find a lot of contests, not specifically related to architectural visualization, but it's a way to create a different kind of project. For instance, take a look at the competition announced by TDT3D, which is specific to architectural visualization artists. 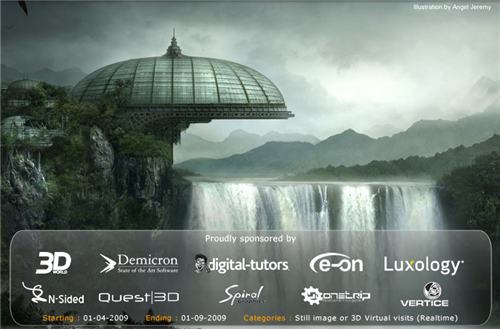 They are running a competition called 3D Architecture contest '09 – create with water and fluidity of elements. It's the type of contest where an architect or group of artists can really put their imagination to the test. At some point we can say that it's a great way to work, almost with no constraints on a real sci-fi project. But, work on a sci-fi project is not an easy task, simply because we don't have any boundaries! How can we find the right time to stop? When will the project look good? As you can see, it's a lot of fun and I will for sure try to register a team formed by some of my students. Of course we will use Blender 3D as the main tool to created the images for this contest. And as you may already notice, the main subject of the contest involves the use of water and fluidity elements. Well, Blender has a great and powerful set of tools to create and animate fluid simulations, and can really be a technological advantage for any artist that choose Blender to participate on the contest. According to the rules of the competition, there are no restrictions about the chosen technology for the contest. It would be really nice to see Blender win, or be a finalist of a contest like this! Would be a great help to bring more artists and users to Blender! What about the prizes? Well, there are a lot of interesting prizes that go from computer graphics hardware, software licenses and magazines subscription. Check out the contest page for a full list of prizes and detailed rules.